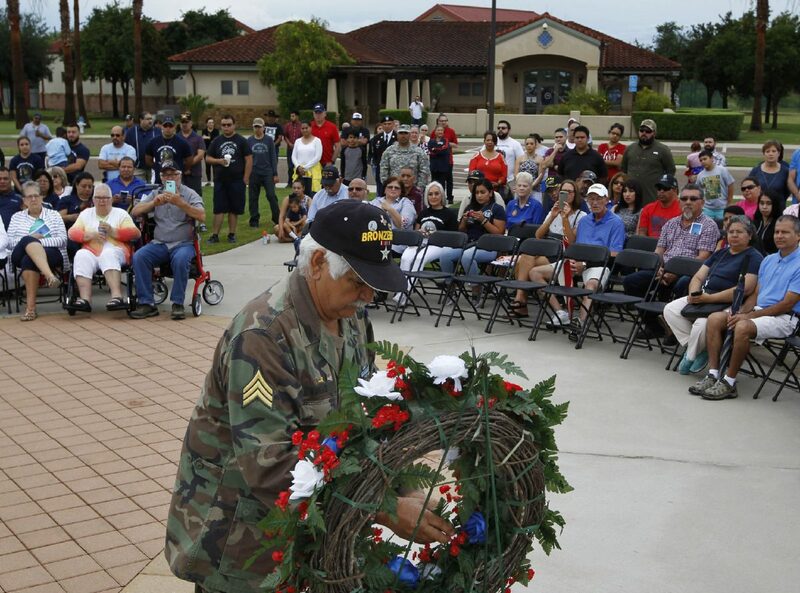 Hector Vargas places a wreath to honor armed forces members who have died during a Memorial Day service Monday, May 29, 2017 at the Rio Grande Valley State Veterans Cemetery in Mission. VFW Post 8788 will host events throughout the weekend to mark Memorial Day. A program will be held at 9 a.m. Saturday at Hillcrest Cemetery in Edinburg. The post is also looking for volunteers to help place flags from 3 to 5 p.m. Saturday at La Piedad Cemetery in McAllen. A Memorial Day Mass will be held at 10:45 a.m. Sunday at St. Joseph the Worker Catholic Church in McAllen. Memorial Day ceremonies will be held Monday beginning at 8:30 a.m. at RGV State Veteran’s Cemetery in Mission, 9:45 a.m. at Hidalgo City Cemetery in Hidalgo and at 10:45 a.m. at La Piedad Cemetery in McAllen. For more information, contact Homer Gallegos at (956) 878-6144. The Kiwanis Club of Edinburg invites the RGV community to help place more than 600 flags on the grave markers of military service members ahead of Memorial Day weekend. The event begins at 8:30 a.m. Saturday at Hillcrest Memorial Park, located at 1701 E. Richardson Road in Edinburg, for a brief ceremony in honor of Memorial Day. It will include speakers from local veterans groups and city officials. Immediately following the ceremony, the placement of flags will take place until 10:30 a.m. All flags will be provided free of charge as well as snacks and waters for volunteers. In addition, the group will be placing flags with the help of H-E-B partners of Edinburg and Pharr at 1 p.m. at Palm Valley Memorial Gardens located at 4607 N. Sugar Road in Pharr. For information, call club secretary Jaime Miranda at (956) 219-3451. The public is invited to gather at 10 a.m. Monday for the annual Memorial Day remembrance event at the Veterans War Memorial of Texas, located at 29th Street and Col. Plummer Drive on the east side of the Convention Center in McAllen. After the ceremony, view the construction of 36 new children walls of granite engraved in American history in the All Wars section. For more information, call Col. Frank Plummer at (956) 631-2511 or Jan Hartzog at (956) 585-1312. A special Memorial Day event will honor and celebrate those who have served the United States in the armed forces with an event at 10 a.m.
Monday at Highland Memorial Park and Funeral Home, located at 6705 North, FM 88 in Weslaco. Refreshments will be available. For information or to RSVP, call (956) 968-5538. Pharr Mayor Ambrosio Hernandez, M.D., city commissioners and city officials will host a one-hour Memorial Day ceremony at 9 a.m. Monday at Memorial Park, located at 501 W. Egly Ave. in Pharr. State and national flags at Hidalgo County offices will be lowered to half-staff Monday and county offices will be closed in observance of Memorial Day. State of Texas and U.S. flags should be raised briskly to full-staff Monday morning and then slowly lowered to half-staff until noon, at which time flags should be raised briskly to full-staff for the remainder of the day.